I had never been in the Nickel Mines area until after the infamous school shootings of October 2006. Even later, I never sought it out. I guess because I knew I wouldn’t feel comfortable doing so. But over the past few years I have happened to pass by a few times. Usually it was hauling Amish friends to somewhere in the southern end of Lancaster County, our route taking us through the community. Shortly after the shootings, the Amish tore down the schoolhouse, not wanting it to become a tourist attraction. Yet today there is a living memorial to the girls–Anna, Lena, Marian, Mary and Naomi–in the form of five pear trees growing at the site. The trees grow in a row along a fenceline. There’s a good chance you wouldn’t notice them if you were driving by and didn’t know where you happened to be. I remember the first time they caught my eye. You had to do a double-take. Five trees, all the same size, growing close to one another in a row. A natural layout that feels slightly more planned than the norm for Amish farms. My Amish friends confirmed that they grew for the girls. Tuesday night, the Amish man went to see one of the wounded girls. A bullet had damaged her brain and she had been brought home to die. “She struggled for every breath and you just didn’t know if she would take another,” he said. Wednesday night, a cold front swept through Lancaster County. 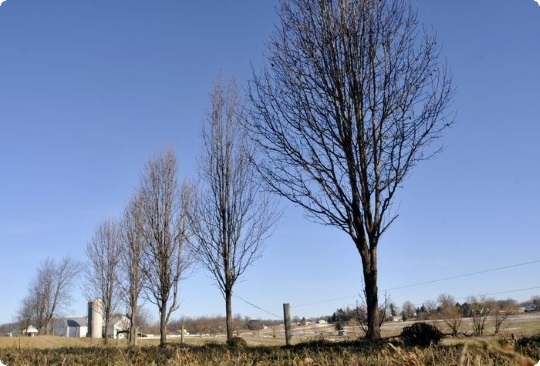 The Amish man had, more than a week before, purchased six young pear trees at a sale at a nursery, figuring he might plant them around a pond on his property. He had temporarily placed them, rooted in large planting pots, near his shed. “Thursday morning, five of those trees had blown over, like dominos being knocked over, but one was left still standing up,” he said. He then had a strong sense that the badly wounded girl would survive. She did. The Amishman’s garage ended up serving as a temporary school for the Nickel Mines children. He and an English employee later decided to plant the five trees at the site, with the sixth planted near the home of the surviving girl. The trees get beautiful white blooms in springtime. For this story. My feelings have been so similar about visiting the area, although we happened to drive through during our last visit to the Lancaster area. Even when not in the area, the fences and bars on windows serve as reminders of both the tragedy and some of the resulting changes. While I can’t say I’m ready to “go looking” for these pear trees, I can say that it there is some comfort in knowing they exist and bloom each year. Thanks to the Amishman for them and to you for the story. Walter sounds like we feel similarly, it’d be different if I knew people in that area but I expect I’ll only see this place in situations like I describe, passing through on the way to somewhere else. One thing you wrote caught my eye — do you mean that local homes have bars on windows as a result of these shootings? By the wording of your comment I wasn’t quite sure which area you were referring to. Thanks. Erik asked: Walter…One thing you wrote caught my eye — do you mean that local homes have bars on windows as a result of these shootings? By the wording of your comment I wasn’t quite sure which area you were referring to. Thanks. Erik, oops, no… I was actually referring to most of the Amish Schools in the Lancaster area. Actually, “bars” may be too strong, but it seems to me many have put grills over the windows. Of course public schools have security almost equal to prisons, but for some reason seeing these simple schools with windows covered, etc. is a stark reminder of how cruel the world can be… so welcome the pear trees! That might resemble what you’re referring to. You can see the basketball hoop attached to the school wall right between windows, which I think explains those grates. Not very cheery especially if you’re on the inside looking out, but I guess it keeps window replacement costs down. I suspect in some (many?) cases that the softball explanation is correct… but for two things. One, I don’t recall noticing many prior to the incident… and two, some of the schools have them on ALL windows. I do know there were other changes as a result, such as all schools being required to have a 911 street address. These are certainly not all “bad” things, but perhaps “sad” things… especially for a group that works hard (and seems to succeed in many ways) to eliminate social ills. There is something to be said for coming up with so many more positive explanations for the window grills. I wonder if keeping the tourists from staring in would work? Not sure that’s a positive, though… but I can tell you that in the public school where I occasionally work, a stranger staring in the window would likely result in a lock down! I think that was a beautiful thing to do. It is for the memory of the girls and it is not commercial. …that they will not only blossom, but will continue to bear fruit. What a beautiful memorial. Well put. The story makes reference to this, but the one of the last times I passed by was shortly after some sort of gusty wind storm in Lancaster County, and we could see one of the trees had snapped. By the looks of the photos they were able to replace it with one of the same size/age. It would be a shame if they had gotten so large that they weren’t able to do that. By the way you can see a photo of the trees in bloom in the slideshow on the Reading Eagle article. I agree. What a nice memorial to those girls! Disagree here. Whenever a “living” memorial is planted and subsequently dies, falls in a windstorm, is knocked over by a drunk driver, it’s even more painful to the folks whose relative had died. I speak from personal experience on this. (And , honestly, if those are Bradford pear trees, they are notorious for getting broken over by wind. Yes, the blooms are pretty, no doubt about that). These trees are not Bradford pears. They are probably either Aristocrat or Cleveland Select Pears. To me, it’s still a moving tribute, and it seems (by what Erik related) that the community cares enough to replace them as needed. I’m sure the people there are familiar with the type of trees they are, and the damage they’re prone to. Still, it was a kind thing to do by the Amishman in the first place. Too bad they weren’t oaks, but the thought is what counts. They may all eventually fall, but then, so did the girls. Speaking for myself, it’s a fitting reminder of how fleeting and precious life is. I think of the day of the shooting often, as it happened during my daughter’s first months as a teacher in an elementary school in a nearby town here. When I first heard the news, I thought of her and her students, and said a prayer that nothing similar would ever happen to them…or anyone else. Of course, it DID happen a number of times since then. Alice Mary, I couldn’t agree more. We do need that reminder… and in this case, I think the story of these trees is a greater tribute than the trees themselves. I’ve never seen the trees; perhaps never will… but the remembrance of these trees, these girls, this Amishman, and this story will persist. One of the more comforting truths I accept is “Nothing is ever lost to us as long as we remember it.” Tributes and monuments are but aides to the memory. Could not agree more. Just as the joy of the empty cross was the result of violence and much sadness, so we must always strive to create faith connection and meaning — to find joy in all things. (1Thessalonians 5:15-18– See that none render evil for evil unto any man; but ever follow that which is good, both among yourselves, and to all men.Rejoice evermore.Pray without ceasing. And…a bit of an aside: we were all (Amish and non-Amish) hurt: the senseless violence among the most innocent and vulnerable among us rips through all our hearts and wounds us to our core. When this tragedy occurred, I was heartbroken for them. We visit Lancaster as often as possible, once a year or so. While on a two day stay it was so on my heart to find the area and just sit in thought. My husband said I would never find it. Well we did and I was so moved, I asked my husband to pull off the road while I just sat there and soaked in the pain and then the forgiveness and finally the renewed spirit. It helped me heal my aching heart just to spend some time there. Are the 3 oak trees still standing? The bars/grills on the windows are to guard them from flying soft balls when they play at recess. They are not for security from the world as far as I know. Softball is a very important game for Amish schools. A moving gesture — and a beautiful story. I just drove down the main road (Mine Road) & the only place that looked like it had 4 tall trees and 2 smaller trees. Are the trees on that main road? I just can’t get over what happened…but perhaps it is good to never forget. I’m not sure how to best describe where they are in Nickel Mines, but when you see them, you’ll know it–there are 5 trees planted in a distinct row along a fence line. Not too far off the road at all. It stands out because they’re all the same size and look like they’ve been intentionally planted. Bob the Quaker, I hope you find what you are looking for and that it gives you the peace that it has for me. I worked in a rural library for 27 years and I became friends with many Amish families, watched their children grow up and some became teachers. This horrible incident became very personal for me and I felt their pain as if it were my own. Spending some time in that place of love and laughter and learning and then all the tragedy helped me heal. Sometimes you have to go to the place whether it be some trees or a tree made into a cross. Cindy, Erik, all. Yes, I did find the trees. My plan was to take a picture with trees in full bloom, then the same shot when they had turned green. Didn’t find them in time, but I’ll be ready for next spring. They were further off the road than I had thought.